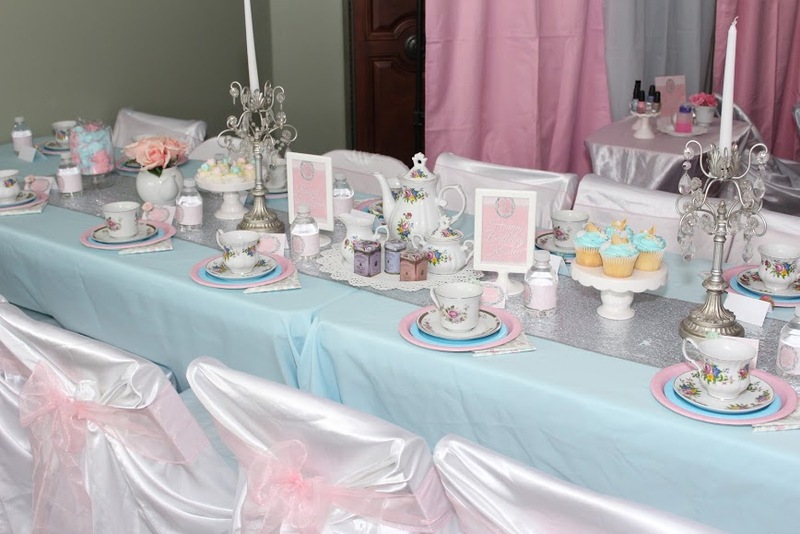 Throwing a princess birthday party for your little girl? A royal party doesn’t have to cost a fortune. Check out these 10 Tips for the Perfect Princess Birthday Party on a Budget. It’s important for all your guests to feel like real royalty. Be sure to ask on the invitation for guests to come in their “Princess Attire”. You can purchase a party pack of comb in tiaras and wands (in gold or silver) from Hobby Lobby. I also love these necklaces and rings available from the Dollar Tree. You can also purchase foam swords (Dollar Tree) or pirate eye patches for any boy guests. What little girl doesn’t love to be pampered? Something as simple as painting nails, adding glitter to their hair or doing light makeup (eye shadow and lip gloss) make a little girl feel special and dressed up. It’s fairly cheap to buy a few bottles of nail polish and eye shadow palette from the Dollar Tree. Display it on a beautiful silver tray (also only $1) and you have a beautiful “Pamper Station”. For any Princess Birthday Party on a Budget it’s important to have a focal table to really set the theme. I love making the food table a focal point with a cute backdrop behind and multiple tiers to display food. You can make a cheap backdrop by hanging tied ribbon, making a solid wall of streamers or creating a curtain backdrop from plastic tablecloths. I add tiers to the food table by stacking sturdy cardboard boxes or dishes underneath the tablecloth to make each item a different height. You can also mix in a few fun props, even kids toys work! Creating a themed menu goes such a long way in creating a beautiful and well put together party. It’s fairly easy to come up with cute names. Think Fairy Godmother Apple Slices, Royal Carriage Cheese Cubes, Splendid Sandwiches, etc. Another great tip is to use a cute frame (either one that you already have or a plain one from the Dollar Tree you can spray paint or glitterfy). Place a piece of scrapbook paper that matches your decor in the frame, then write your menu on the glass with a Sharpie marker (easily removed with nail polish remover). This makes a great display piece for the table and helps your guests know what is being served. BONUS TIP: Plan your party for the mid afternoon (after lunch but before dinner). You will only need to serve ‘snacks’ instead of a whole meal and can save money on the food! Making a backdrop from plastic tablecloths is super easy and thrifty! Purchase tablecloths in coordinating colors. I love doing a symmetrical backdrop with three panels (the outside two in the same color and the center one contrasting). Open the table cloth and fold the shorter end accordion style in 1-2 inch panels. Use a hole punch to make a hole in the top. String ribbon through the top and you’ll have a beautiful draped curtain look. The string can then be thumbtacked or taped to the wall/ceiling with minimal damage. You can add additional pieces to swag across the top for an extra regal look. A table setting is an important part of a princess party. Layer your table with one color as the base tablecloth and a runner in a contrasting table. Use complimenting colors for the place settings. I love using two different sized plates so it looks more elaborate. Think of the bottom plate as more of a charger. With $1 pack of plates at the Dollar Tree or Walmart, it’s not too expensive to double up and adds so much to the overall look! Don’t forget napkins, cups (I love these goblets from the Dollar Tree) and a few centerpieces. The Dollar Tree has so many pretty flowers and vases all for really cheap. Different sized vases and flowers mixed together create a beautiful royal table for your princess party. 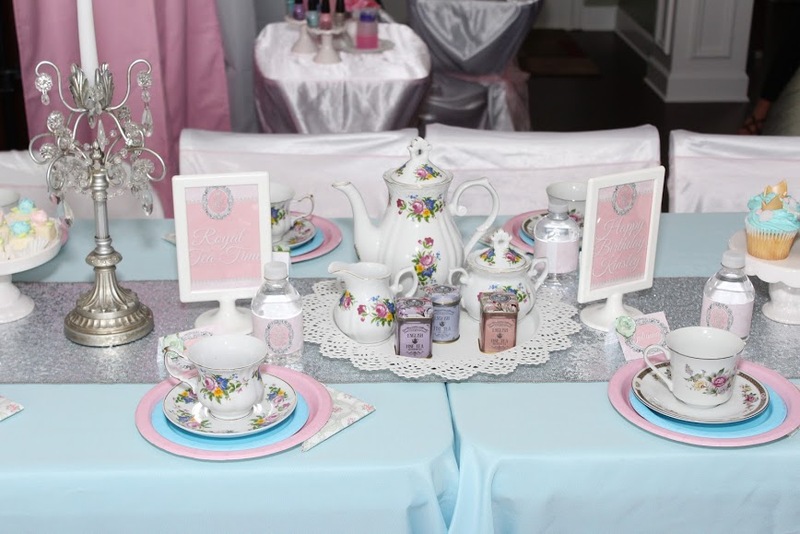 BONUS TIP: Skip the licensed princess party decor and opt for solid colors that match the theme instead. Not only will this save money but it also provides a classier more refined look. There are SO SO SO many sites that offer party printables for FREE. If you don’t see ones you love here on my site, try searching Pinterest or Google for your theme. Placecards for your guests, welcome sign, banner, water bottle labels, etc are all beautiful details that are low cost. This is a great way to entertain your guests without having to spend money on a bounce house or character. I love this tiara craft from Hobby Lobby. Here’s a great resource for princess party games. Kids love playing hide and seek. 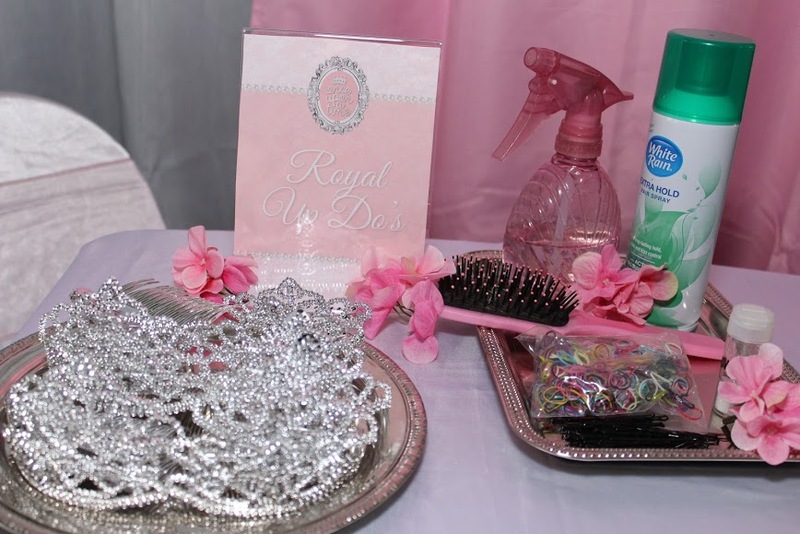 Try adding a fun princess element (like a stuffed animal, glass slipper or tiara). Have the guests search for the item and tell them “hot” or “cold” as they get closer/further away. Another fun game is to purchase sugar cubes from the grocery store and have everyone race to see who can stack them the highest. Let’s face it, most kids (and parents) don’t really appreciate cheap favors anyway. Opt for a fun dessert bar or candy buffet instead. If you’re already providing a tiara and accessories to wear and take home you also shouldn’t feel pressured to also provide a favor bag. It’s not a party without music. A fun princess soundtrack is a great way to set the mood and get everyone in the princess spirit. If you don’t already have a princess soundtrack laying around, use Pandora with a portable speaker so you don’t have to purchase any music. Throwing a princess birthday party? I’d love to hear additional tips to throw a fun and affordable Princess Birthday Party on a Budget! I love these, how cute is everything?! Really great tips!! And super cute decorations! Super cute! I always find so many great decor items at the dollar spot!